FlatPoint is a Responsive Multi-Purpose Theme with minimalist, simple, elegant and clean style, a strong focus on contents and readability. It presents a modern business solution. FlatPoint is suitable for multipurpose websites such as business, company, portfolio or blog. It is superbly responsive adapting to any kinds of smart phones and mobile devices. Code is easy to modify and understand so you can personalize it in the easiest way. Current upgraded release is v1.1.0 and much more new amazing features are coming soon in the next updates. You are eligible to free download of all future updates once you purchased this theme! Enjoy using this awesome theme! 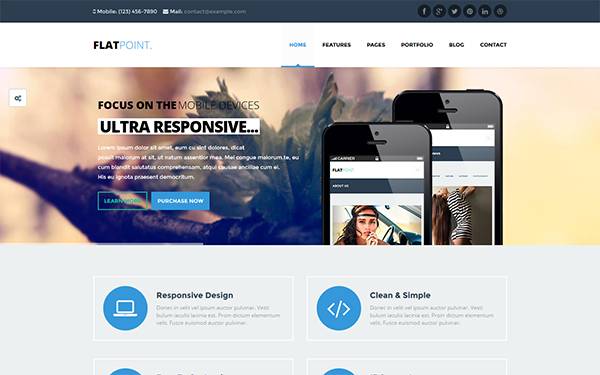 Item Reviewed: FlatPoint - Responsive Multipurpose Theme 9 out of 10 based on 10 ratings. 9 user reviews.